An outlying region of Tamita State, Kebo Atoa is a crescent shaped island in a shallow lagoon in southern Irukandji. 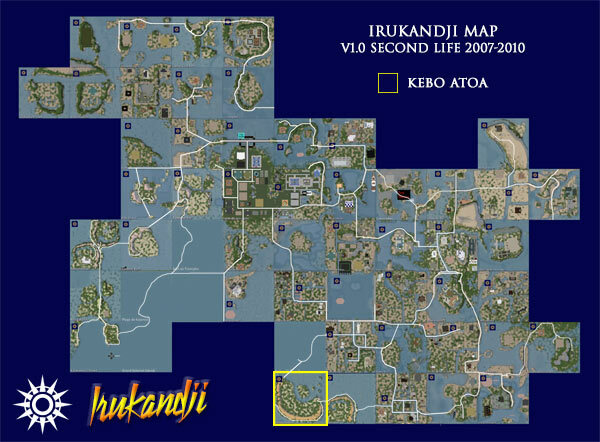 The simulator, Kebo Atoa, came along midway through the life of the Irukandji story in Second Life, as the estate continued to grow westward. Kebo Atoa, given its low density and 'estate-edge' location, was very well received. All parcels were eagerly purchased, gained a population quickly and featured several nice homes. Prior to its subdivision and settlement, Kebo Atoa was, and still is, regarded as an island of immense historical significance. More information is available in the history section below. Kebo Atoa was designed and landscaped by hand as I wanted a blank canvas given its distance from the main Irukandji continent. The island is connected to Sulawesi Bay in the east, and to Irukandji Sound in the north, via the Trans Irukandji Causeway which hugs the outer rim of the island. Neighbouring regions of Kebo Atoa, clockwise from north are Irukandji Sound, Pinjarra Island, and Sulawesi Bay. Kebo Atoa lies immediately southwest of Pinjarra Island, home of the Pinjarra clans. The once-nameless atoll and its lagoon had always been the traditional private retreat of the reigning Pinjarran elder of the time. In 1975, upon Irukandji becoming an independent kingdom, the Pinjarran elder, Kebo, grandson of the famous independence leader, Pinjarra, named Kebo Atoa for himself. Four years later, assassins under his command murdered the king's family which led to civil war. Kebo was eventually defeated and killed by the Tamita elder, Savu, here at Kebo Atoa. The full story is told in the Tamita-Pinjarra War.